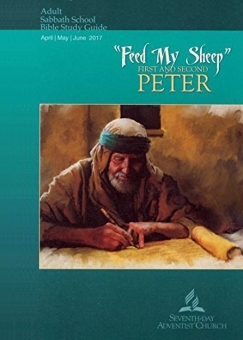 COMMENTARY ON "MAJOR THEMES OF 1 AND 2 PETER"
Today the writer quotes one of my favorite verses but doesn’t really go anywhere with it. I think it’s important when dealing with this passage that it be juxtaposed against some of the things that Ellen White taught about the atonement. Notice in the Bible it is Jesus that bears our sins, but in Ellen White it is Satan. This is a really important gospel issue that needs to be pointed out to Adventists. I understand not all SDA believe in Ellen White, but all should know that it is Jesus who bore our sins and completed the atonement, we don’t have to wait for the devil to do it. Some Adventists will object and point to Leviticus 16, with the temple sacrificial system. They will assert that the scapegoat is type and shadow of Satan taking away the sins of the world. The problem with this, is that the whole concept of type and shadow comes from Jesus teaching on the Old Testament being about himself. Those passages are the reason that we dig into the Old Testament for type and shadow of Jesus. It’s not some arbitrary construct imposed upon scripture. We look for it because Jesus told us to. We don’t look for type and shadow of Satan bearing the sins of the world etc. We are not told by Jesus to look for that. So this categorically removes the scapegoat in Leviticus 16 entirely from even possibly being Satan. Instead, we should look at this scapegoat as Jesus, who bore our wickedness (or Azazael), and took it from us as far as the east is from the west. To any SDA who reads this, I just want you to know that it is Jesus who bore your sins, not Satan. This is actually a decent lesson, I like that the author points out Jesus dying as a substitute for us. Too many liberal theologians today deny penal substitution so it’s nice to see that this author doesn’t. I like that he is leaving Satan out of the atonement altogether. Would be nice to see him bring up Ellen Whites false teachings in that regard and rebuke it as a heresy. Considering the context of SDA teaching and the fact that this is directed to Adventists who have likely read Ellen White he probably should. But the fact that no heresy is being outright taught today is a positive. The writer correctly identifies Peters exhortation for good works as a response to what Christ has done for us. This is important because Ellen White flips it around to where it is one’s good works that earn what Christ has done for us rather than something we do in response out of joy and gratitude. The writer is very wrong in suggesting though that Peter is talking about Sabbath keeping. Peter never actually speaks about the Sabbath at all in any of his epistles. One would think that if the Sabbath were to be a last test of mankind by which one is sealed by God that at least one prescriptive command or exhortation to keep the sabbath would have come up after the cross. But it never does. Instead we are taught that we are sealed by God the Holy Spirit. What I liked about today’s lesson was that the author kept the reader focused on the basic tenets of the Eschaton (End of Time). He didn’t get lost in the weeds and burden the reader with unnecessary assumptions or start quoting false prophets. The only thing missing from this lesson was the Gospel, I think the author should have pointed out that the believer is judged on the merits of Christ whereas the unbeliever is judged by their own merits. Otherwise though great lesson. It appears to me that the author is touching on the concept of two kingdoms theology. The idea is that God has given us both Government and the Church. It’s not the same thing as separation of Church and State, as the theology also applies to nations with a state Church. The idea is that in so much as the law of the land can be observed without violating the law of God, then you follow the law of the land. What I want to focus on in today’s lesson is the second paragraph as I think it has implications for the rest of the lesson. Notice in the above passage Peter warns us of people who are misunderstanding and misinterpreting scripture. He doesn’t apply anything else to this, there are two nouns only. The scripture itself and the reader of it. The writer of the lesson speaks of some kind of lens or filter that he implies is produced by God the Holy Spirit as a key for unlocking scripture. I simply wish to point out that Peter didn’t add that category, the author of the lesson did. Furthermore, the author doesn’t clarify what he means by this. I can only guess one of three things based on my studies of SDA theology. He means we are to expect the Holy Spirit to provide a personal revelation of the meaning of the text as we read it. He means that the means God the Holy Spirit gives us to understand scripture is simply scripture on the same topic. I think #3 is being generous but since the writer didn’t say what he meant by it I am going to assume the best and include it. The problem with #1 is that no matter what it’s going to be adjudicated by the reader, there is a level of subjectivity that is insurmountable even when true. Do you know for certain that the liver shivers you experienced while reading a passage was God the Holy Spirit? Was it your own personal desire bleeding into the text through the power of suggestion? Was it something you ate? Or heaven forbid, a spirit from hell itself? The problem is you can never know for certain. I’m not denying that people have profound experiences, I’m just saying they have a very low epistemological value. The problem with #2 is now you’re leaving scripture. Now, just like the magisterium and tradition govern the Roman Catholic interpretation of scripture you’re using Ellen White in the same fashion. If the author means #3 I agree whole heartedly. God the Holy Spirit has given us the Word of God, so that in and of itself is our means of interpretation. Reading the Bible and believing it’s teachings is how God the Holy Spirit reveals it’s meaning to you. Everything else must be epistemologically below scripture. The author makes a grave error in the further thought, he teaches that good works are a means of purification rather than a result of it. To make my case I’ll use the same passage that the writer did and a few others. Notice that the purification of our souls in obedience happens through the Spirit. The author just left that point out and I honestly don’t see why. Notice above that the saving by Grace through Faith comes before the good works do. Your good works are not helping Jesus save you at all. They don’t even exist until you are saved. Before that you’re dead in trespasses and sins. Here's the idea, there are no good works outside of Christ. Even Ghandi for example, no good works at all. He may have done some things that natural man considers to be great, but the fact that we see his works as good outside of Christ only highlights our own depravity of the flesh. Once your flesh is mortified in the blood of Christ your wickedness is no longer seen, it’s gone, you’re seen through the blood of Jesus. These are the good works you are doing that were prepared beforehand, those that you do in the blood of Christ. Only the good can shine through that, and it is only such deeds of man that can truly be called good in a spiritual sense. I don’t care how pious and charitable you think you are, if Christ does not cover you it’s all filthy rags. Copyright 2017 BibleStudiesForAdventists.com. All rights reserved. Revised June 14, 2017. This website is published by Life Assurance Ministries, Camp Verde, Arizona, USA, the publisher of Proclamation! Magazine. Contact email: BibleStudiesForAdventists@gmail.com.